Battenfeld Technologies has created a new Joystick front rest that allows shooters to adjust BOTH windage and elevation with one movement of the control arm. The 18-lb Caldwell “Fire Control” rest from Battenfeld operates much like a Farley, but it is about one-quarter the cost ($199.00 at MidwayUSA, item 956104). 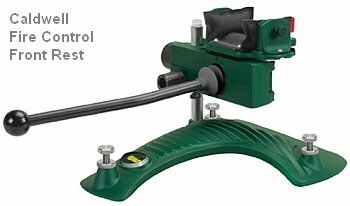 The new Fire Control rest features stainless steel leveling feet on a 28″ x 9″ cast-metal base. 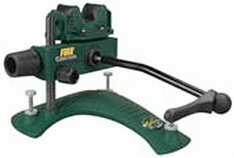 It offers 50″ of vertical adjustment (at 100 yards). The Fire Control rest comes with two front bags — a traditional medium-width bag AND a 3” lobe bag. Midway is still waiting for shipments of the rests. G.I. Joe’s Outdoor Supply, 1-800-442-8834, gijoes[at]mchsi.com , has them in stock right now, for $199.95 or $210.00 delivered to lower 48. 1. The narrow bag that came with it is too thick, so you will have to have a tall rear bag to use it unless you are shooting down-hill. 2. The long joystick rod (with ball end) attaches to a short shaft (in the rubber boot) with one screw with a plastic head. That would be fine but the short shaft is round and the end of the attaching screw is flat. So you either must tighten the screw so tight that the plastic might break or mill/file a flat on the side of the short shaft. I plan to mill a flat section on the small stud shaft with a Dremel so the longer handle can’t slip and rotate. 3. When it came out of the box, the joystick couldn’t even hold its own weight and would fall to the bottom of travel. I was able to increase the tension, however. 4. The coarse vertical adjustment was so tight it would move the whole rest turning the knob. Those were pretty much all the problems I could find with the rest. The good part is the instructions tell you how to adjust joystick tension and course vertical to your liking. After making the adjustments, the joystick moves freely with good positive motion. It’s not glass smooth but is good enough that I won’t complain. I imagine it will get smoother with time. I had a 17-lb rifle sitting on it just to see if the vertical height would creep down and it didn’t move in 45 minutes. The base seems to be a good design. When pushing the gun into the rifle stop the Fire Control doesn’t tip as easy as my Hart base. The Fire Control is a little narrower (from side to side) than my Hart, so I can get the Caldwell closer to the edge of the bench where I like to be. One gripe — my Fire Control didn’t include the bubble level shown in the pictures. With the rest at its lowest setting, the cradle sits 6.5″ above the bench. I didn’t measure the range of motion but at 100 yards its definitely enough to cover a standard Hunter Benchrest Target and then some. I did notice, with the 17-lb gun, that when the joystick hits the very top of adjustment it drops just a touch when I let go. This can probably be adjusted out or I will just set the coarse adjustment a little high center on the target. I like the way the Caldwell adjusts for height with the knob on the left side. For me it is nice not having to deal with the wheel and screw method for changing course elevation. At my home I shoot on a slight downhill grade and have to change back and forth a lot when I go to the range. I did have a buyer for this rest if I didn’t want to keep it but I think I will hang on to it. I’m not even trying to compare this rest to some of the ‘works of art’ that are out there but for someone like me that really wanted to use or at least try out a joystick rest but couldn’t justify the cost of a Farley or Seb, this is a good option even if it’s just to get your feet wet and upgrade later. Cost was less than $200 plus shipping. 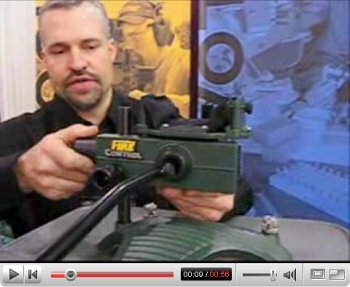 Share the post "Fire Control Joystick Rest — User Review"
Michael Bane’s Shooting Gallery broadcasts highlights from the 2007 Steel Challenge today on the Outdoor Channel. The Steel Challenge World Speed Shooting Championships were founded in 1981 with 70 shooters competing for $20,000 in cash and prizes that first year. In the 26 years since, the match has grown to become one of the crown jewels of the shooting circuit and the premier professional pistol competition with more than 220 of the world’s fastest shooters competing for over $390,000 in cash and prizes in 2007. The 2007 event featured the Outdoor Channel/Sig Sauer 80-Second Challenge. The first shooter to break 80 seconds overall time on the 8-stage Steel Challenge course, the equivalent of the 4-minute mile, could take home a check for $30,000. The show airs April 16, 2008 at 8:00 pm Eastern time on the Outdoor Channel. In related news, the 2008 European Steel Challenge will be held May 2-4 at Winterswik, the Netherlands. Over 150 of Europe’s best competition pistol shooters will compete for the European Speed Shooting Championships and €25,000 Euros in prizes. Championships will be determined in the Women’s, Senior, Super Senior divisions and in several categories including Rimfire, Stock and Open class Pistol/Revolver — the Formula 1 category of the shooting sports. For more info, visit www.EuropeanSteelChallenge.nl, or contact Hans Wigger, firearms [at] firearms.nl . 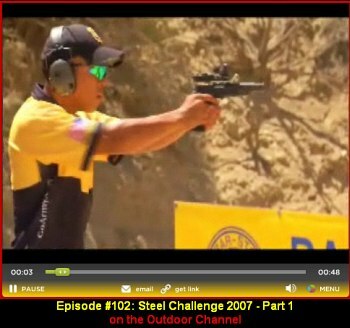 Share the post "Steel Challenge on Outdoor Channel Today"